Are You a Candidate for Joint Replacement? Has postop lab work run amok? A study 319 total knee arthroplasties (TKAs) has found that postoperative lab work has run amok. A retrospective review of cases performed at a single institution over a two-year period says "yes." Mohamad Halawi, M.D. an orthopedic surgeon at the University of Connecticut Health Center in Farmington and co-author explained his rationale for the study to OTW, "The practice of ordering laboratory tests on a routine basis is a lingering habit from the days when hip replacement was a lengthy operation, was often performed under general anesthesia, and not infrequently resulted in a number of hemodynamic derangements, particularly acute kidney injury and symptomatic anemia." Much as it did with total knee arthroplasty, the Centers for Medicaid and Medicare Services (CMS) is gearing up to promote outpatient total hip arthroplasty. Mohamad Halawi, M.D. an orthopedic surgeon at the University of Connecticut Health Center in Farmington and co-author on the study, explained the objective of this study to OTW. "Effective January 1, 2018, the Centers for Medicare and Medicaid Services (CMS) removed total knee arthroplasty (TKA) from its inpatient-only list. This move has created significant confusion among surgeons and hospitals due to limited information on the selection criteria for outpatient vs. inpatient surgery in this patient population." FARMINGTON -- Sometimes, medical advances don’t happen in one big “Eureka!” moment. Sometimes, like with hip and knee replacements, they happen slowly, over the span of many years, as much from a change in thinking as anything. Imagine coming to the hospital in the morning, getting your hip or knee replaced, and then going home that same day. 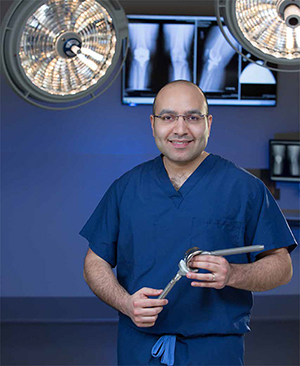 That dream is starting to become a reality for some UConn Health patients, thanks to the arrival of Dr. Mo Halawi, an orthopedic surgeon specializing in joint reconstructive surgery. For a man of just 34 years, Dr. Mo Halawi has seen a lot. Born in war-torn Lebanon, he came to the United States alone at the age of 17, against his parents’ wishes. It wasn’t an easy journey, but he’s now a successful orthopedic surgeon, proving that hard work and determination truly can lead to the American Dream.